I had the pleasure of working for a lovely couple just minutes from my home in Massapequa Park. That was a nice change of pace, as I'm usually fighting traffic on the LIE of local parkways to get to and from a job. 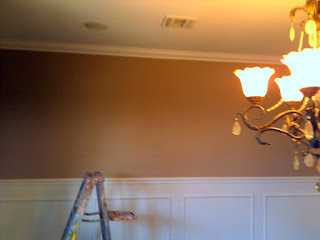 The dining room was already painted with Sherwin Williams Tatami Tan, which is a warm, soothing color. 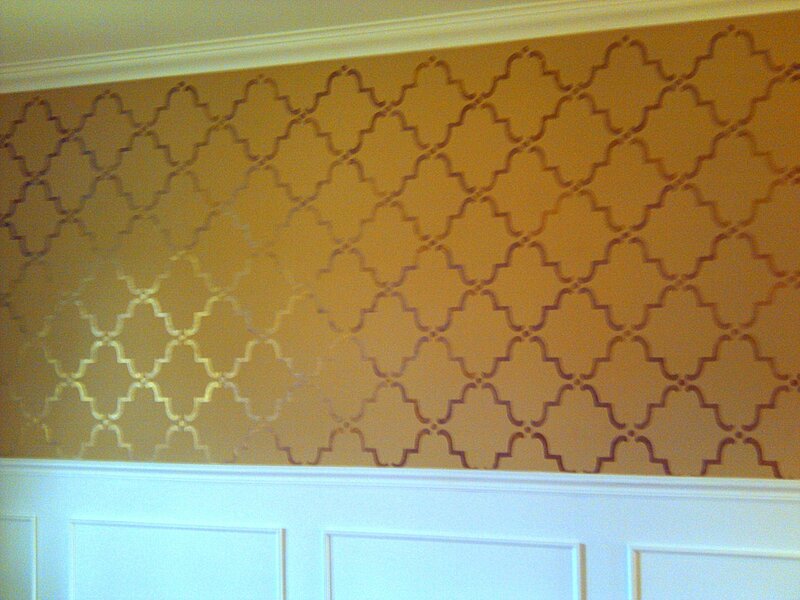 My client chose the "Large Moorish Trellis # 933L" stencil from Royal Design Studio. This was a great choice, as it gave just enough impact to the wall, and makes a beautiful statement. It adds a "wow" factor to the room that every room cries out for. Melanie Royal has an imagination that knows no bounds. She continues to amaze and inspire with all her stencil and modello creations. Her site is: www.royaldesignstudio.com. I used the chandelier as my inspiration. 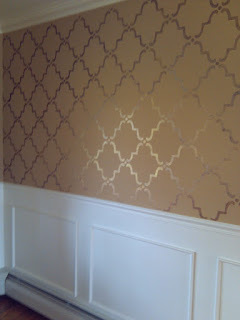 Its main color was bronze, but there were also other metallic shades delicately worked into the finish. I used colors such as statuary bronze, warm silver, gold rush, metallic bronze, champagne, and blackened bronze, from several different brands. 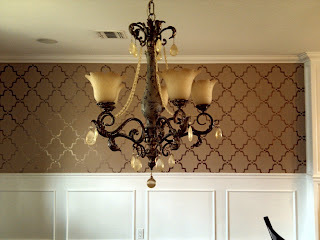 Each color was carefully applied through the stencil in a a fashion that mimicked the finish on the chandelier. I hope to get better pictures the next time I go back. I am happy to say that my client was thrilled with the results, and I will be going back to add some more "wow" to her kitchen backsplash and hallway medallion. Thanks Regina! Melanie Royal is so phenomenal, isn't she? I've been following you and your amazing blog for quite awhile. I kinda did it backwards by starting a blog before I learned how to design it, list blogs I follow, etc. But hopefully as time goes on I'll get better at it, and it will show in my blog. We all have to start somewhere, right? Thanks for following. Hi Debbie, nice to meet you! Thank you for visiting my blog and your nice comments! I've been browsing yours and when I saw this I had to tell you how stunning it looks. 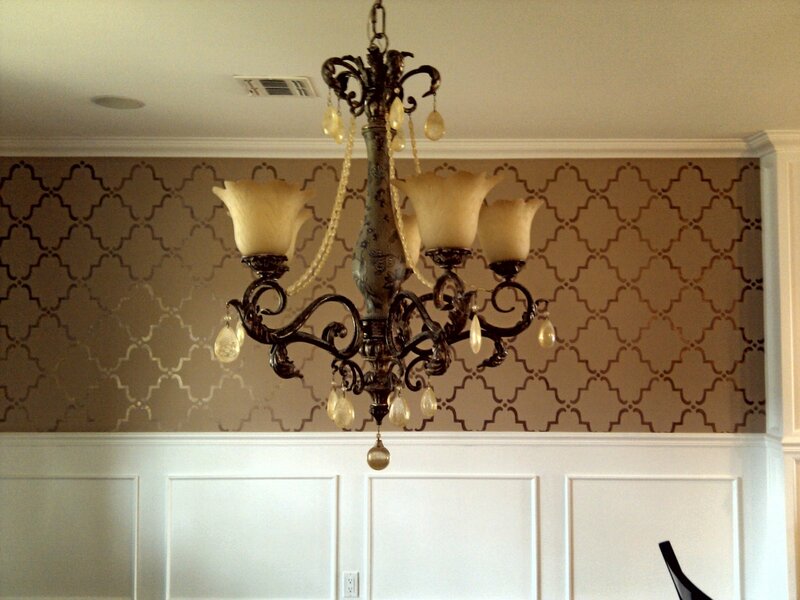 The stencil color looks fantastic on that wall color and I like how you took your cue from the chandelier. What a nice compliment coming from you! I can't wait to get back there for the next project so I can take better pictures. I only heard the phrase "linky parties" last week, and have been meaning to designate time to learn what it's all about. Enjoy your summer hiatus. Maybe one day we can meet for a cup of coffee, or should I say lemonade!